You cannot miss one of the most loved cities of Tuscany, Siena: a city rich of history and art, whose traditions are connected to the history of contradas and of the famous competition called “Palio”. Since Middle Age the city has been divided in 17 contradas, which challenge each other twice a year in a medieval Joust known as “Palio”. This is set in Piazza del Campo, which is the centre of city life and one of the main attractions for the tourists. The Town Hall, where inside there is the Civil Museum with many art pieces of senese artists, overlooks the square. An unmissable stop in order to digest a typical tasty lunch and enjoy a suggestive sight of the city is the Mangia Tower. Other points of interest: The Cathedral, the Baptistery and the Art gallery. Good&Tasty: typical cooked meats, pecorino, honey, fegatelli, cantucci, ricciarelli, panforte, cavallucci and the classic Vin Santo. This village in Val d’Orcia, an hour by car and an hour and a half by public transport from Siena, is known for its charming scenary given by the uniqueness of the main square, “Piazza delle Sorgenti”, which is occupied by a basin of spring water. This thermal water runs into many streams that cross the streets of the town and flow in a natural pool, where it is possible to relax and enjoy the view. Located 20- minutes drive or 50 minutes by public transport from Bagno Vignoni/ an hour by car and an hour and half by public transport from Siena, there is a beautiful Renaissance village called Pienza. It is an architectonic and urban jewel, “born from a thought of love and a dream of beauty”, as the poet G. Pascoli wrote. Because of its charming architecture the village has been included in World Heritage List of UNESCO. Among the main attractions as, for example, Palazzo Piccolimini and the Cathedral, the tourists enjoy the view over Val d’Orcia from the Streets of Love: Via dell’Amore, Via della Fortuna, Via del Bacio e Via Buia. Another medieval village worth of being visited is Montepulciano, located between Val d’Orcia and Val di Chiana valleys an hour and a quarter drive/ an hour and half by public transport. It is known for its typical products: among these the most famous is Nobile di Montepulciano Wine, which is preserved in an historical wine cellar placed in the basement of Palazzo Ricci. Porta di Gracciano, which is the gate to the city center, guides the tourist through the main street that leads to Piazza Grande, where there are the Cathedral and the Town Hall. Return to Siena in the evening. Overnight stay in Siena. The critical fase that is hitting the italian economy and other European nations can't make us forget that we live in one of the most beautiful country in the world, that can give us many opportunities (touristically, culturally and naturally) also without cost. And if we are in a moment that also the low-cost seems to cost too much we can't miss the opportunity and we point to the new trend of...no-cost. At the beginning it seems like an impossible thing to find 'something' in Florence without cost; an 'something' that can give more appeal at your staying in this unique city without affect – however – on your budget. Thanks to some information found in the forum – and to some call in the right place – we prepared for you some tip no-cost that will make your journey absolutly unforgettable. The first thing that we signal you is that on every first Sunday of the month the entrance in all the Statal Museums in Florence will be free. A walk through typical markets don't cost nothing but give always a wave of joy. So here's a selection of Florence markets. - THE MARKET OF SAN LORENZO: It's located from Piazza San Lorenzo to Via dell'Ariento, around the Basilica of San Lorenzo (in the historical centre of Florence). It's one of the most important market in the city where you can find clothes, leather goods, souvenirs, local gastronomic product and more. Open every day except sunday and monday. -THE MARKET OF SANT'AMBROGIO: it's located in Piazza Ghiberti and in Piazza d'Ambrogio and has an internal and esternal part. It has fresh fruit, vegetables, clothes, flowers, shoes and electrodomestic stand. You have to do the groceries shopping? So enter and you can find fresh meat and fish, pasta, food in general and good cheese. And if you're hungry try the restaurant inside the market, good and low cost. The market is open all the weekend (except sunday) from 7 to 14. -THE MARKET OF CASCINE: located inside the beautiful Parco delle Cascine (the biggest park in Florence) open every morning thursday from 7 to 14. Probably is the biggest and the most affordable market in the city! And then after doing shopping don't forget to walk in the park. -THE FLEA MARKET: the famous FLEA MARKET of Florence is located in Piazza dei Ciompi and is open every day from 9 to 19:30. If you can go in the last sunday of every month, when the stands goes even on the surrounding streets. Here you can find furniture and ancient object, paintings, coins and jewels. Here you can also find real treasures with a cheap price and many antique trade. It's really worth to go there...it's like going back in the past. - THE FIERUCOLINA: it's a biological market that promote the biological agricolture and biodynamic in small size, with products of the farmer gastronomy and manual crafts, that are completely handcraft, natural and free of chemical substances. It held every third Sunday of the month (except August) in Piazza Santo Spirito (Oltrarno). - THE MARKET OF THE PIGGY, in Florentine straw, hand embroidery, leather goods, objects in wood, flowers. Address: Piazza del Mercato Nuovo, every day from 8:00 to 19:00 except sunday and monday morning. Florence Free Tour is the original walking excursion of the city of Florence. It's free but it's nice to give a tip to the guide for contribute to mantain active this beautiful service to sustain their generosity and motivation. You can choose between two routes that start both from the Station Santa Maria Novella every day: the route 'Renaissance' or the one of 'Medici's Family'. Located at the second floor of the Oblate Library, the cafe of Oblate it's a service open to everyone since may 2009. Beautiful location overlooking Brunelleschi's dome. Florence is rich of church and, for the most part of it, the entance is free. Between these we remember the Basilica of Santa Maria Novella, one of the most beautiful church of the city that host Giotto, Masaccio and Ghirlandaio's operas. Inside the basilica we find an Pharmacy Office founded from the Brothers in the 1221. Here, the fathers used to coltivate in their vegetable gardens medicinal herbes to prepare the medicine, balms and ointments for their small infermary of their convent and today it's used the same artigianal process for the preparation of the spices, liquor, cosmetics and pharmaceutical products. The entrance is free at Santa Maria del Fiore (the Duomo of Florence), third church of the world (after San Pietro in Rome and San Paolo in London) is the biggest in Europe. The entrance is free even in the beautiful church of San Benedetto, which first news are in the 1002. San Benedetto is the only Church of Florence dedicated to the Saint founder of the western Monasticism, today patron as well of Europe: Benedetto from Norcia (480-547). You don't have time and you want to choose an theme excurtion? Go around the SQUARES OF FLORENCE. You prefer to relax surrounded by the nature? Then choose from the many PARKS AND GARDENS of the city with free entrance: the Giardino delle Cascine, the Giardino dell’Iris, the Etruscan tomb of the Montagnola, the Giardino Torrigiani, the Giardino delle Rose or Villa Favard. All year long, the Florence Hostel hosts a variety of free initiatives such as drama theatre, concerts etc in summertime they take place in the beautiful garden surrounding the hostel. The beautiful Costiera Amalfitana in known most of all for its beach, the sea and the caractheristic localities that rise between its fiords, destination for tourist that came from every parts of the world. However, if instead of 'looking down' (toward sea) we try to 'looking up' (toward the Lattari's Mountains), the view will not be less amazing. In fact, a lot of tourist doesn't know that the coast is dominated by impressive mountains so rich of beautiful and fascinating phats to be called - as a whole - the Path of the Gods. The path of the Gods is constituted from old mule that, for century, represented the only way to communicate with the local popolation. Even if now there's a paved road (accessible by car) that links the small town of Amlfi with Agerola, a stroll on the path of the Gods is an unforgettable experience and, most of all, adapt for everyone because there're different paths of length and slope. The Path of the Gods: (length 8km) from square of Bomerano until Positano. Along the route we pass under the “biscuit cave” where, beyond the particular geology shape of the rock, it's possible to admire centuries of rocky houses stuck in the cave. Passed the locality of Colle Serra, it opens an unbelivable scenary on the Sorrentina's peninsula. The Path of Sources: (length 5km) from Campora, near the source Acqua Leggia, a path that go along with the river Penise, in a green valley between chestnut trees. Along the path we can encounter ancient rocks shelters and ruins of an old bourbon tinderbox, the sources of Fiubana, San Giuliano, Acqua Fredda and at quota 1000, the Acqua Vracciara one, where we can admire an wonderful landscape on the gulf of Naples and of the Vesuvio. The Path of the Pick of Sparviero: (length 6km) from the little square of San Martino, Capora, entering an century terraced mule, we arrive to the locality Pontechito, with an a fantastic view inside the hollow of Agerola. Continuing between the chestnut wood, we arrive to the peaks of Sparviero and Colle delle Vene, where it opens an beautiful landscape on Amalfi, Ravello and the gulf of Salerno. The Path of Praia: (length 4km) from square of Bomerano we pick the mule in direction of Santa Barbara and after passing through the homonym cave where is possible to admire the ruins of an ancient church of the XI century a.C., we deviate to the right to cross the river bed of the river Praia. The ancient path go through, then, the costal village of Praiano and Vettica Maggiore, to go down, at the end, on the cost. From here, near the church of San Luca, we pick the stairs for cala di Rezzola. The Path of Tre Calli: (length 6km) at the centre of Bomerano we pick the way for the locality Pendola, continuing, then, for Paipo. We go through the Casino of Paipo (of bourboni era) and we continue until the cleft of Capomurano. Here it bends at the south following ridge of Mountain Calabrice to arrive to Mountain Tre Calli where is possible to admire the view of 360 grades on Agerola and the Costiera Amalfitana. The Path of the Giant's Teeths: (length 7km) at the back of the church of San Pietro (suburb of Pianillo) it starts the mule that go up to Lococli and Sughero Hill where we enter on the Height way of Lattari's Mountains. We follow it in the West turning around the rock pyramid of Sant'Angelo's Mountain with three laces, until the Saint Water cave. From here we go upon highest peak of Salerno. The Path of the Horrid Pine: (length 5km) from the square of Bomerano we pick the mule for S. Barbara, we pass through the valley of the homonym cave and we arrive to Furore; continuing through the street we pick the path that leads to the cleft of the river Schiato. The path pass through the river near an ancient mill and then we go up again to S. Lazzaro. The Path of the Dawn: (length 4km) at the centre of S. Lazzaro we pick the drivable way for Radicosa, then the ancient terrace mule for Murillo's Mountain, for turn around it to south-east. Arrived to Vallone Vocito we come back to the south to arrive at the convent of Cospita (medieval era). The Path of the Ancient Republic: (length 4km) from the landscape of S. Lazzaro we pick the ancient stairs that go down to Tovere and then to Vettica Minore. We can end the excursion on the seaside of Santa Croce. The Path of Seafront Village: (length 4km) near the landscape of Fausto Coppi we pick one of the stairs that go down on the coast. Arrived at the deep cleft called Furore's Fiord we encounter an carachteristic and ancient seafront village recently restaured. SALERNO “AVE GRATIA PLENA”, the first quality certified AIG hostel from Hostelling International. It's located in an ancient monastery of the XVII century, that has all the modern comfort even if it's located in one of the most ancient street of the city centre. Avaiable for the guest: multilanguage workers, reception open 24h, Wi-fi, electronic keys, Tv rooms and more. The beautiful seaside of Costiera Amalfitana, with gems like Amalfi, Positano and the Island of Capri are only a few minutes of distance. The one who prefers staying in the city, during the day can arrive in the suggestive city centre walking (in the famous Via dei Mercanti) to do some shopping and, at night, be delighted by the night life that Salerno give thanks to the several pub and wine bar (where you can taste delicious plates). NAPOLI “MERGELLINA”, located, in a panoramic position, at less of 10 minutes by car or bus at the city centre. The hostel has also private rooms and double rooms, all with a private bathroom and wi-fi: it's ideal for groups and families or who travel alone. The Park of the Po Delta is one of the biggest humid areas and most beautiful in Europe. The majestity of the river, the vast reed beds, the encounter with the sea, the overwhelming amount of birds, of shapes and colors between land and water make the Delta enchanted atmospheres and arouse unique emotions. Several are the excursion in the area, one of them is Gran Bosco of the Mensola, a rare beauty and full protection, is one of the few examples of forest still exist in the Po Valley. Particular suggestion is the presence of red and fallow deer, and common and marsh turtles. It can be completed (by bike) following the educational panels with information about flora and fauna. From Goro, for example, in boat you can advance the most secret recesses of the mouth, uncovering the silence of the reeds along the canals, a large and varied bird life, or visit the typical huts of the valley, typical guard homes where they practice ancient systems of fishing and farming. The Valleys of Comacchio (result of marshy around the eponymous large lagoon) where the extraordinary natural scenery and can discover the trades and activities of the lagoon, of yesterday and today. Comacchio is the most original and fascinating historical center of the Po Delta. Heir to ancient Spina, founded on islands based exclusively on the water its urban and economic development. Even today it has drawn from water and a dense network of canals and bridges that unite the neighborhoods, terraced houses in pastel shades that hide long aisle leading to inner courtyards. Do not miss the load of the Roman Ship Museum, the Portico dei Cappuccini and the Manufacture of Marinated (old factory manufacturing eel). Not to be forgotten the dense network of ancient and monumental works and the reclamation buildings. You can't miss the visit to the Abbey of Pomposa, a remarkable example of Romanesque architecture of the eleventh century, a place of great beauty and where the monaco Guido d'Arezzo invented the seven musical notes. Calabria is one of the most beautiful and oldest sites of Mediterranean area: according to the Greek mithology, Calabria first inhabitants indeed named our beautiful peninsula, in honor of their King Italo. Many populations came to the 'tip of the boot' from the whole Mediterranean area and left many different evidences that nowadays lend Calabria its charm unique of its kind. At the same time Calabria has been able to open up to the most modern tendencies, and become a top destination for many young people. Although Calabrian sea is one of the most beautiful in our country, even in winter this fascinating land is able to offers majestic and impressive winter landscapes and ski resorts equipped like the best-known of northern Italy. Not to mention the beauty of Calabria natural parks and the amazing “cultural Calabria”. Here follow some tips about wonderful places (not too much known, unfortunately) that are worth a visit and the indication about our hostels located in the area, which provide the perfect base to immerse yourself in the history, culture and nature in … the tip of the boot ! In winter, Camigliatello Silano is completely covered by snow and turns itself into a center for winter sports, hiking in the woods and walkings by the lake. Camigliatello Silano is an area of pure mountain (at 1300 height on the Sila plateau) and boasts an ideal location: even if it is nestled in the high mountains, the city of Cosenza and the sea are less than half an hour away. What better time to visit Cosenza, called the “Athens of Calabria” for its historical and cultural heritage that in 2008 was declared “City of art of Calabria”. Moreover, in 2011 its cathedral was declared by UNESCO as "witness of culture of peace", the first award given by UNESCO in Calabria. And while you're there ... what about an escape to the amazing coastal villages just in time to see the sunset? On the Tyrrhenian coast you can visit Diamante, Belvedere, Cetraro and Falerna Marina. On the ionic coast you can stop in Amendolara Marina (where you find Hotel Enotria, belonging to our network). Continuing south, you will reach Catanzaro the "city of the two seas", Capital city and important business, commercial and cultural center. The city lies on Marcellinara isthmus and in Summer its 8 km of beach become a top destination for youth tourism. However, also in winter these fishing villages can be extremely attractive (sometimes more than in summer). Before leaving Catanzaro, we recommend a visit to Scolacium Archaeological Park, rich in natural beauty and hosting significant archaeological finds. now, you can start going down to the Ionian coast and stopping in its pretty villages, until you get in Reggio Calabria. Monasterace is one of the most scenic locations of the area: in its seaside there are the remains of Kaulon, thriving colony of Ancient Greece; in the upper part of the village - instead - you can admire its small medieval town, where you can find some of the most important Calabria architectural works. What about a coast to coast, now? In fact, Catanzaro is located in the narrowest point of Italy, where only 35 kilometers separate the Ionian Sea from the Tyrrhenian Sea. You can cross it, reach the picturesque Violet Coast (so called for the characteristic color given to the sea by the vegetation) and visit Scilla, Favazzina, Bagnara, Palmi seaside (Marinella) and tuna fishery, up to Reggio Calabria, where you can have a walk on Falcomatà boardwalk, considered the "most beautiful kilometer of Italy ". Reggio Calabria is the most populous city of Calabria, nestled between the Tyrrhenian Sea by one side and the Aspromonte Mountains on the other. A walk on the famous promenade and a visit to the Archaeological Museum of Reggio Calabria to admire the majesty of the Riace Bronzes, will make you trip unforgettable. Our hostels will be happy to accommodate you! During your journey in Calabria you can stay in our hostels, which meet everybody’s tastes. In Cosenza district will be glad to host you in Altomonte, Rossano Calabro and San Donato di Ninea. On Catanzaro Ionian coast you can stop at San Domenico Hotel in Soverato, Quadrifoglio Hostel in Taverna, St. Andrea Apostolo allo Ionio, Guardavalle Marina or Falerna Marina (this one on the Tyrrhenian coast). Ready to be fascinated by the charm of this beautiful and wild area? Run to discover it, then!! We need to know Assisi and all Umbria to understand well San Francesco. In the youth of the “poor of God” are liked the devious and suggestive streets and the square that surround his house while, at the centre of Assisi, are located the Cathedral of San Rufino (where was baptize) and the Basilica of S. Maria Maggiore (where he renunced at his father eredity, disroping himself in front of all the city and proclaiming to see only the paternity of God and the sky eredity). Out the city there is the Church of San Damiano, where the Crucified indicated to the Saint the mission of “Restaurator of the Churchs” and where blossomed the “Cantico di frate Sole”. Not far away, on the Sunbasio mountain and immerce in the nature, it rise the Eremo delle Carceri: here legend and history blend together to sing the devotion of Francesco for the Virgin Mary, which the small chapel was dedicated. An autentic memorial of the italian art is, than, the triple Basilica of San Francesco, where the most famouse artist, for centuries, gathered. The main festival: the Festa del Perdono of Assisi (31 july-2 august); the Festa of Santa Chiara (12 august); the Festa of San Francesco (3-4 october); the Celebrazioni del Natale and the ri-evocation of the ancient times with the Festa del Calendimaggio (30 april-10 may). In the 1205 San Francesco arrived in Foligno, on saddle of a horse full of precious fabric after the Crucify – at San Damiano – he order him to «restaur the church». Foligno did one of the most generous act from Francesco because, here, the Poor of God sold fabrics and horse, he returned walking to Assisi, he presented himself to the preach that custodized San Damiano and gave him the money that he acquired. In francescana company Foligno is particulary important because here was borned brother Paoluccio Trinci that – in the 1368 – start the renovation of the Francesco's Order with the movement of Osservanza, that had its first site in the Folignano mountain (at Brogliano of Colfiorito). At the apostolic journey conduct by the Saint in the south of Umbria in the 1212 – 1213, are liked with francesani's memories of Amelia, one of the most ancient abitant of Italy: city that, according to the tradition, was built from Amiro, King of the “Aborigeni”, 383 years before Rome. The village of Amelia rise castled on a rocky hill, which slopes unfold expanses of oaks and olive trees, interrupted only by the river Tiber. Today Amelia is a dynamic and modern city, which has been able to profit from the favorable geographical location to establish itself as agro-food center as well as archeological and artistic site. In 1213 brother Francesco went to Terni and, after a few days of stay reached the village of Collescipoli. Just in Terni, the site of the oratory of San Cassiano (donated to Francesco in 1218 by the bishop Rainerio). Today you can visit the Monastery of San Francesco, with the Church built between 1265 and 1288 that still preserves evidence of the original building. Built as a Franciscano Sanctuary in 2004, the Church is in the current historic center of Terni. The Amalfi Coast is a stretch of Italian coastline worldwide known for its natural beauty and declared World Heritage Site by UNESCO. The Amalfi Coast can be reached in different ways, maybe making some stops in archaeological or touristic areas. For example, you can get to Naples by plane and stay in our Mergellina YH: you can visit the city and take the opportunity to draw up a "travel plan" to reach Salerno through the Amalfi Coast. The Youth Hostel Mergellina is located in the colorful neighborhood of Mergellina (from which it takes its name) and can provide various types of ensuite rooms, suitable for individual travelers, couples, groups of friends and families. 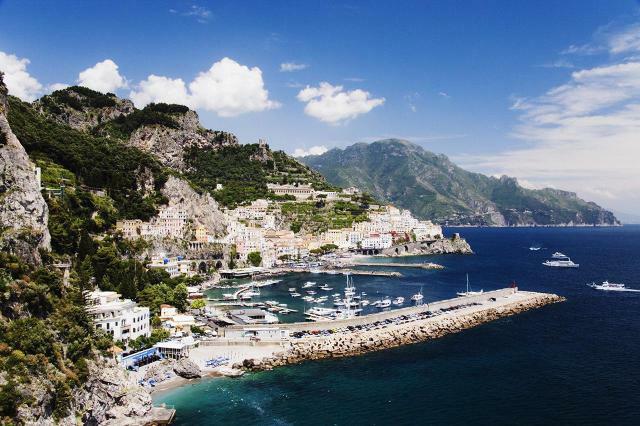 In Naples you can rent a car and spend a few hours in Pompeii or Sorrento (reachable in less than half an hour) and then go on to the Amalfi Coast: the stretch of road that leads from the Sorrento Peninsula to the Amalfi Coast is characterized by sloping cliffs overlooking the sea. The landscape changes at every turn, showing suggestive views that take your breath away. Otherwise you can take a bus from the airport to Sorrento and then visit the Coast moving by SITA bus or ferry and hydrofoil. Heading south you reach the charming Salerno, a modern city that preserves its historic atmosphere thanks to the medieval area, the nineteenth-century buildings overlooking the Riviera, the municipal park. The district of Salerno is the hugest of Campania and includes - among others - the Amalfi Coast, the archaeological area of Paestum and Cilento promontory. Here you can stay in Ave Gratia Plena youth hostel, a former convent dating back to 1600, finely renovated and equipped with all modern comforts. The hostel is located in one of the oldest streets of the town and was the first in Italy to receive the Quality Certification issued by Hostelling International. Vietri sul Mare, famous all over the world for its ancient tradition of pottery. Take advantage of our 2 hostels in Campania to visit this part of Italy that the whole world envies us!